From this tutorial you’ll learn how to change website permalinks Category slug. First, log in to your website Administration panel (Dashboard). 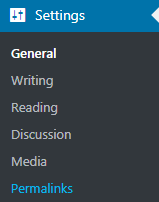 Find Settings tab in the left column of the Dashboard. Go to Permalinks sub menu. In the Categories base field define the category slug you want to use. Save the changes. Now you’ve changed Categories base for your website’s categories archives. A new custom slug will show up in the address bar when the visitors view categories. This tutorial is based on Movie Responsive WordPress theme.